Welcome to another edition of Off the Shelf with Melinda & Michelle! I’m joined once again by Soliloquy in Blue‘s Michelle Smith. This week, we pull a few shojo titles off the shelf from Viz Media and Tokyopop, mixed in with shonen and seinen favorites from Viz, Del Rey Manga, and Vertical, Inc.
MICHELLE: It was a dark and stormy blog. Intrepid manga reviewer Melinda Beasi was braving the elements in order to get home in time to read some books! Did she make it? Oh God, did she?!?! MELINDA: Never fear, because she did! And quite joyfully, too! This was actually an incredibly pleasurable week for me, because I spent my time with the latest volumes of three of my favorite series. 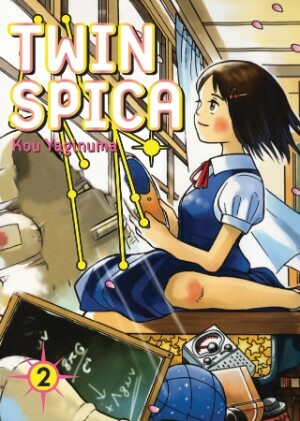 First, I finally sat down with the second volume of Twin Spica, my favorite new manga series so far this year. The story is about a teenaged girl, Asumi, who vies to be part of Japan’s re-emerging space program, just fourteen years after a deadly accident stopped the program in its tracks. The first volume was fairly stunning (you can read my review here), setting the bar for the second impossibly high, or so one would think. With an introduction so strong, I was quite surprised to find that I liked the second volume even better. The first volume spent a lot of time setting up the universe of the story and introducing its main players, including Asumi, her “imaginary” friend Lion-san (which I’ve put in quotes because I simply don’t know), her widowed father, and two girls entering the space program at the same time. This was all done beautifully, leaving readers full of warmth and wonder. Volume two jumps right in to Asumi’s new life as an aspiring astronaut. Suddenly, she’s on her own away from home, learning to navigate Tokyo, trying to make friends, and struggling in a program where she’s so tiny, they have to make custom equipment for her. What started out as a wistful, nostalgic story about nurturing dreams in an environment tainted by years-old pain is now introducing us to school politics, adult grudges, and a lot of real-world ugliness that puts Asumi’s dreams in depressing perspective. While this might cripple a weaker series, it really strengthens this one. Asumi’s still the same girl, but her warm, dreamy nature isn’t going to hold up easily in the face of real intimidation. While it’s certainly painful to watch this play out, it’s also really compelling, and I can’t wait to see what happens in the next volume. MICHELLE: I’m planning to give that a read myself in the near future. It sounds a little like NANA or We Were There in a “hurts so good” kind of way. MELINDA: There’s certainly some of that quality here, though unlike both of those series, it’s Asumi’s childlike innocence that creates much of this story’s poignance, despite how damaged so many of the characters are. With her round, smiling face and optimistic worldview, Asumi could easily be your standard shojo heroine, yet here she is, so out of place in a very seinen world. It’s fundamentally incongruous, yet extremely effective. Add in the hard sci-fi premise, and this title has the potential to appeal to an unusually wide range of readers. So what have you been reading this week? Or have you just been, y’know, loafing around? Like a loafer. MICHELLE: I’ll admit, there has been some loafing. 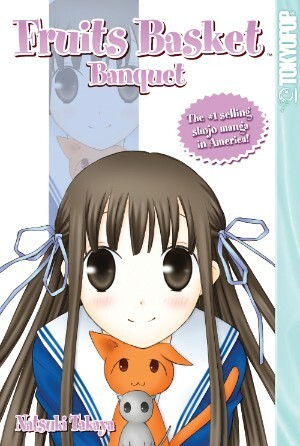 I did manage to read Fruits Basket: Banquet, however. I normally find fanbooks fairly boring, but found this one to be quite a lot of fun. Like others of its ilk, it features things like a reader illustration gallery, several quizzes, interviews, and the results of character and couples popularity polls, but it’s more interesting than most. Some of the quizzes are neat—many rely on showing a particular panel then asking “What happens next?” or “Fill in the speech bubble”—but to me the very best part was the results of the best chapter contest. I loved reliving some of the most touching moments of the manga and you know you’ve written a good series when just a brief snippet of Yuki finally calling Tohru by her first name can make me get all verklempt. There’s also a short manga with the cast reacting to their placement in the character popularity poll that’s really cute. Also, I was happy to see the pairing of Yuki and Machi take second place in the couples contest. I’d always assumed she was unpopular, but maybe that was just in the American fandom at the time. MELINDA: Oooooh that mention of Yuki and Machi has caused me to burst into a million tiny hearts! I really like her so much and their relationship was one of my favorites to watch grow over the course of the series. It wasn’t as flashy as the main pairing, of course, but it was so sweet and idiosyncratic. THE BAG OF FERTILIZER. Oh, really, I die. MICHELLE: Admirably! I certainly love Tohru and Kyo, but the one whose progress makes my heart swell fit to burst is Yuki. So, what else ya got? MELINDA: Well, I can’t lie, I did some loafing too. But I always have time for a new volume of Hikaru no Go! We’ve now reached volume 20, which is making me start to mourn the end already, but there’s still a lot of life left in this series. It’s graduation time for Hikaru, marking his shift into the adult world as a full-time Go professional. Both he and Akira face their mentors in official matches, proving that the older generation is not ready to lie down just yet. The real treat in this volume, though, is the introduction of Yashiro, a young pro from the Kansai region who is in competition with Hikaru and the others to earn a place on the Japanese team for the upcoming Hokuto Cup. He’s even crazier on the goban than Hikaru, which really helps keep the tension up and promises great things for the next volume. One of the things that makes this series so special is the way Hotta and Obata manage to take the worn-out convention of fierce combat (whether in battle or sport) followed by “leveling up” and make it feel completely natural, and this volume is such a great example of that. Yashiro’s a formidable new opponent, but he’s also just another teenager, concentrating on his game and worrying about convincing his parents that he’s got what it takes to succeed as a pro. On top of that, though Hikaru always strives to win, there’s never a sense of inevitability about it, because as exciting as “winning” is, it’s never been established as being anywhere close to the point. Maybe Hikaru can defeat Yashiro. Maybe he can’t. Either way, whatever happens next is guaranteed to be important to his evolution as a person. We’re watching Hikaru grow up in a very genuine way, so even strict adherence to standard shonen formula can’t make this series feel actually formulaic. MICHELLE: Is Yashiro the one from the anime special who astounds everyone by playing his first move in the very center of the board? If so, I’m really looking forward to this arc because it’s something I haven’t read before. I love the way the anime ended—corresponding with volume seventeen of the manga—but I’m completely unspoiled on the manga from here on out (aside from the glimpses afforded by that special) so I’m excited to see how it’ll all turn out. I also can’t help but wish for a cameo from a certain spoilery someone, too. MELINDA: Yes, he’s the one! I think you’ll really enjoy reading this when you get there, because it’s so nicely done. 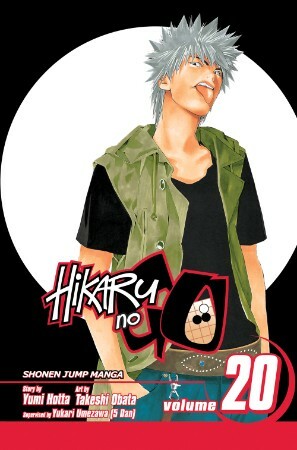 One of the things that’s a bit unique about this series is that its hero, Hikaru, is actually my favorite character, which is so frequently not the case for me. Yet Yashiro is so interesting, he actually gives Hikaru a run for his money on that front. It’s a lot of fun for me, and I think you’ll appreciate it as well. MICHELLE: It’s pretty rare for the main character to be my favorite, too, actually, though in this case I love Sai best. MICHELLE: Next for me this week is the debut volume of Dengeki Daisy, a new Shojo Beat title by the creator of Beast Master. It’s the story of Teru Kurebayashi, whose ailing brother gave her a cell phone and told her that it would connect her with Daisy, someone who would protect her in his place. This is a really cute story that imbues familiar story elements with original twists. Student-teacher romances are so common they might as well be a sub-genre of shojo manga, but have you ever seen a student-custodian romance? The lead characters are fun—the scene where Kurosaki shows up to rescue Teru from some sleazy dudes wielding an edger endeared me to him forever—and I like that this is one of the cases where the boy is attuned to his feelings and the girl is oblivious. There may be a little too much of Kurosaki helping Teru to learn valuable lessons for some people’s tastes, but it really doesn’t come across as condescending or creepy at all. Mostly, it just seems like, being older, he’s had more experience than she has. I really enjoyed this first volume and am eager to continue the series! MELINDA: Oh, that really does sound like a cute series! I have this volume waiting for me as well, and you’ve made me feel quite anxious to get around to it. I was actually concerned that the age difference might make this feel creepy, but I’m relieved to hear that’s not the case. And it sounds like it has a similar sensibility to Beast Master, which I found very charming (though I only read the first volume). MICHELLE: I’m not exactly sure what the age difference is, but I think it’s probably only a few years. And yes, I am quite sure that if one enjoyed Beast Master, one will like this. MELINDA: That’s really good to know. I’m afraid my own high school was very much lacking in the area of hot young custodians. MICHELLE: Yeah, reading this inspired me to try to remember custodians I have known, and all I could come up with were some faint memories of some very depressed-looking individuals lugging trashcans around. This volume marks a turning point in several ways. With Watanuki taking Yuuko’s role with a client for the first time (the request was for cooking lessons, after all), he’s really risen to the occasion, determined not only to grant the woman’s wish, but also to confront her true problem–that she’s afraid to get to know herself by eating her own cooking. Though his approach is markedly different than anything Yuuko would have tried, that’s actually what’s wonderful about it. If there was any doubt remaining at this point about how much Watanuki has grown over the course of the series, this volume surely satisfies. As Watanuki reveals himself in order to help his client do the same, he also discovers something that seems certain to shift the entire focus of the series. Visually, this volume is gorgeous as always, and there are some panels near the end that rival CLAMP’s best visual storytelling. It’s an extremely effective volume on all fronts, and I really look forward to hearing what you think of it when you get there. MICHELLE: I really admire the way CLAMP has taken Watanuki from a rather spazzy and unsympathetic character in the early volumes to someone who has become much more gentle and learned to trust others. I really like Watanuki now, and I definitely didn’t when the series began. MELINDA: I always found him endearing, even when he was a spaz, but it’s been a real pleasure to watch him evolve into the compassionate young man he is by the beginning of this volume. I kind of want to hug him. So, now that I’ve revealed my true nature as a loafer, what have you got to round off the evening? 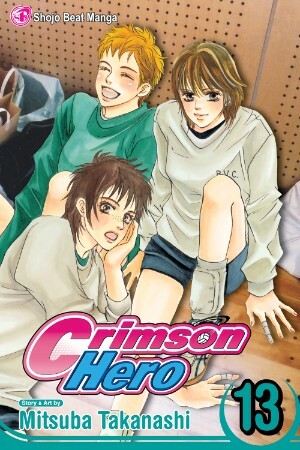 MICHELLE: I’ve just polished off volume thirteen of Crimson Hero, which is, I think, the only shojo sports manga currently being released in America. This series is kind of hit-or-miss with me—I really like it when it focuses on the ambitions of the girls’ volleyball team and depicts their matches, but easily tire of the romantic triangle going on between protagonist Nobara and the two stars of the boys’ team, Yushin and Haibuki. This volume is particularly ridiculous. Haibuki has disappeared in a fit of pique after learning that Nobara and Yushin are an item. Meanwhile, another guy who wants to go out with Nobara seeks to achieve this by blackmailing her with the knowledge of her living arrangements (she’s living in the boys’ dorm and working as the dorm mother). She refuses to give in, and the next day, the news is all over school. The repercussions are extremely over-the-top, with the end result that Nobara is sure all these rumors are going to harm Yushin’s reputation, and because he won’t stop caring about her and further embroiling himself in the drama, her only recourse is to declare that she doesn’t love him anymore. It’s just so frustrating and dumb. Can’t they just play some volleyball or something?! MELINDA: Oh how I weep when romance actually derails a shojo manga. It’s the one thing I really expect to be well-done, even when everything else has fallen to pieces. MICHELLE: There certainly have been some nice moments between Nobara and Yushin over the course of the series, but it seems like the mangaka didn’t quite want them to be together yet, and so is tearing them apart again and having the teams practice in different locations for a while so the end of the story can be victory at the Spring Tournament and reconciliation. And I’m sure that’ll be satisfying when it comes, but in the meantime I just want to smack Nobara upside the head. MELINDA: Right now, though, it sounds like you were better off… loafing. MICHELLE: Ha! Maybe so. At least I contributed to my local library’s circulation numbers by checking it out. MICHELLE: I think I’ll try my hand at lollygagging instead. MELINDA: Always contrary, you are. Clearly, it’s getting to be my bedtime. Join us here next week for a new monthly feature (it’ll be a surprise!) and then again the week after for a brand new Off the Shelf! 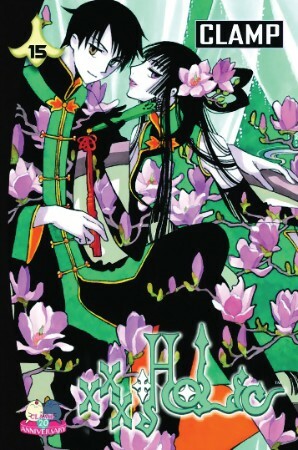 Sidenote: I haven’t been able to bring myself to read xxxholic 15 yet. I’m a big old wimp *is scared*. I love this series but it is emotionally exhausting in a way only a very few series are for me (I’d put We Were There, Fruits Basket and NANA in that category). Each volume is delicious torture in many respects (particularly later volumes). 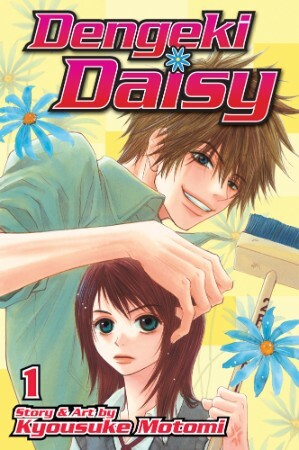 And yes, doesn’t Dengeki Daisy look cute? I’m anxious to read it now too. But yes, it’s pretty clear that Kurosaki is not an authority figure of any kind. He’s quite the slacker, really, and has a real blue-collar sort of vibe to him.